My daughters’ school decided that this month was Math Facts Month. They’ve challenged all the kids to practice math, either fact families or math skills, each night. They didn’t send home worksheets, flash cards, or any sort of manipulative. They just sent home a simple sheet of ideas and told us to have fun. 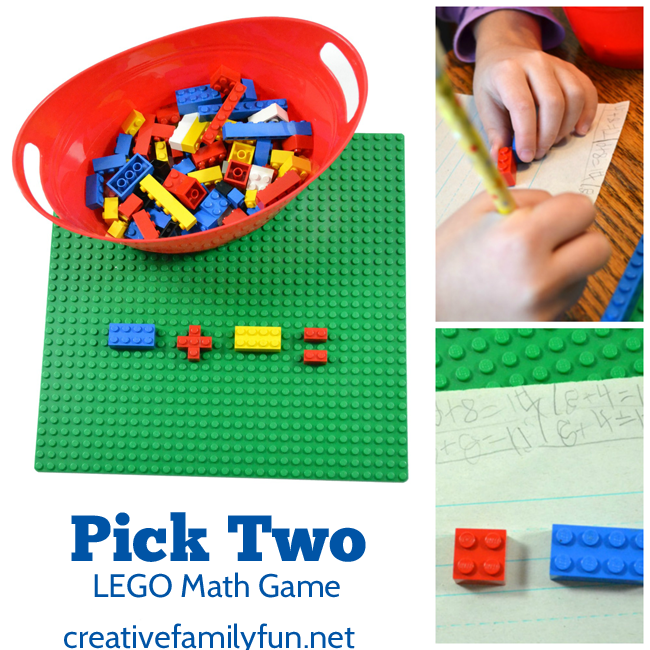 So, I took one of my girls’ current obsession, tossed it together with a little bit of math, and came up with a fun way to practice, Pick Two: LEGO Math Game. 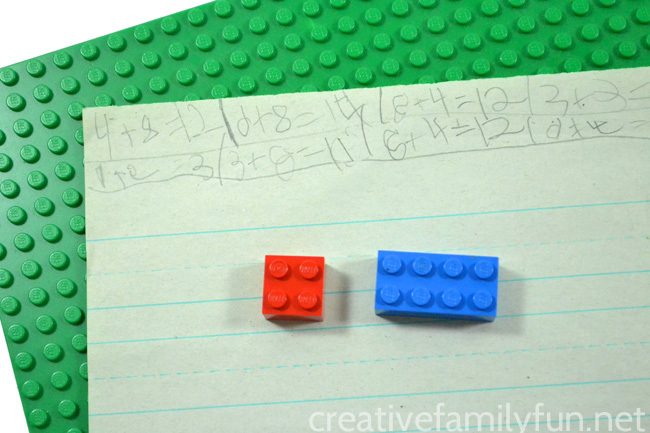 What happens when you combine LEGOs with math? Well, at my house, you end up with a kid who is eager to do as much math as possible. True story. Maybe this Math Facts Month will be a breeze. 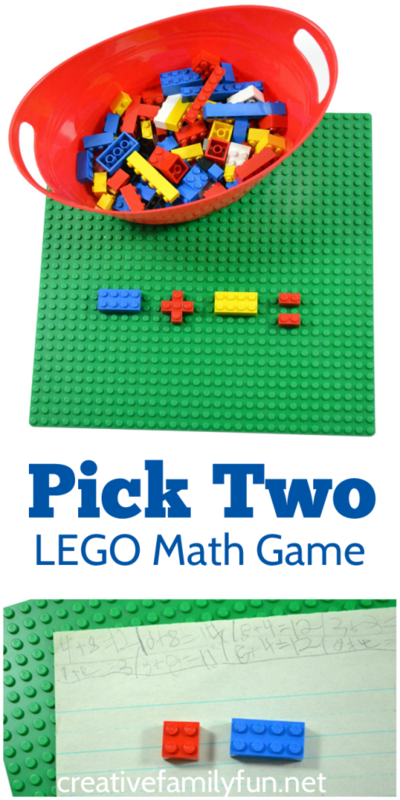 The set-up for this LEGO math game couldn’t be easier. 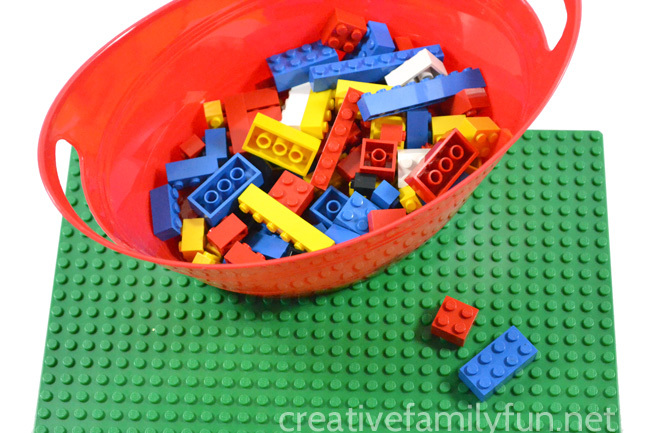 Just grab a container and fill it with LEGO pieces. 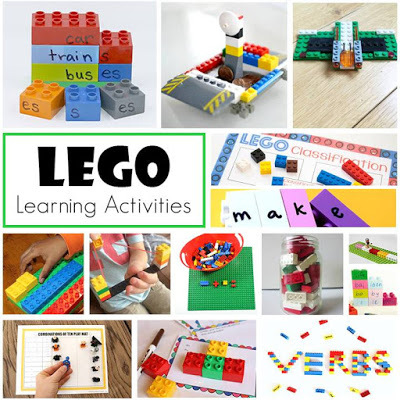 Try to find a variety of blocks of different shapes and sizes. I only used the basic bricks because the specialty pieces won’t really work well with this game. I also grabbed a big base plate to give my daughter a place to organize her bricks. The only other supplies we needed were a pencil and a piece of paper. My daughter would close her eyes and grab two LEGO bricks from the bucket. She then wrote out an addition problem for the set she pulled out using the bumps on the each brick. For instance, if she pulled out a brick with 4 bumps and one with 8 bumps, she wrote the equation 8 + 4 =?. She then figured out the answer. Many times she had to count the total number of bumps to get her answer. That’s okay, it’s all a part of learning to do addition. The best part about this game is that it’s easily adaptable. 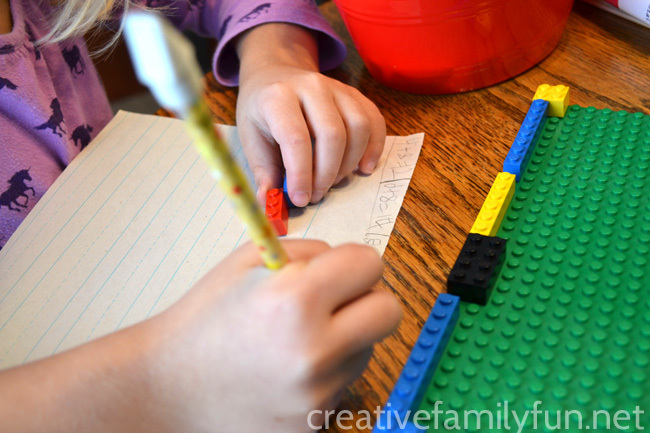 Create subtraction problems with your two bricks. Pull two bricks and multiply the amount of bumps on each brick. Your preschooler can decide which brick has the most amount of bumps or the least amount of bumps. Have your preschooler count the total number of bumps on the two bricks s/he pulls out of the bin. Grab three or more bricks and add them all together. Grab four or more bricks and put them in order of largest to smallest, or vice versa. Thank goodness for LEGO. Math Facts Month is going to be a breeze.